On the burst: Damien Comer is chased by Andy Mallon and Caolan Rafferty of Armagh in the GAA Football All-Ireland Senior Championship, Round 2B, at the Athletic Grounds, Armagh. The reward for Galway's hard-fought three-point victory over Armagh (1-12 to 0-12 ) on Sunday at the Athletic Grounds is a home tie with Derry this Saturday evening (5pm ) at Pearse Stadium. And while the game is being shown live on Sky Sports, it would be fantastic to have a big home support at the game to cheer on Kevin Walsh's side. Derry is a tough side to break down and, as this will probably be Galway's last home game of the year, fans should really try to make the effort to be there to help the team dig out what would be a massive win. Derry had an easy win last weekend over Wexford by 1-16 to 0-10. Their most impressive forward was Cailean O'Boyle, who hit three points from play from number 15. He had good support from Eoin Bradley at full-forward and Mark Lynch at centre-forward, who scored 0-6 (0-5fs ). The Galway defence will need to maintain last Sunday's high standard, where Cathal Sweeney excelled in his man-marking job on Jamie Clarke. After the Armagh win, Galway boss Walsh was understandably pleased with the way his team hung in and managed to hold on to their lead despite not scoring for the last 24 minutes. "Yeah, I thought we played like a tight bunch. To be fair, I think if yourselves and the public looked deeper into the Mayo match, I think we got a bit of unfair criticism," Walsh said. "But that's great, because it drove us on. I'm very happy with the result. Any time you win, there is a thrill, and especially when there is a big challenge put in front of you, like Armagh was. It is great to get a result in a place like this." The Galway management team learned from the Mayo defeat too and, when they saw a need for a change, they acted promptly with Danny Cummins coming on for Sean Denvir at half time. 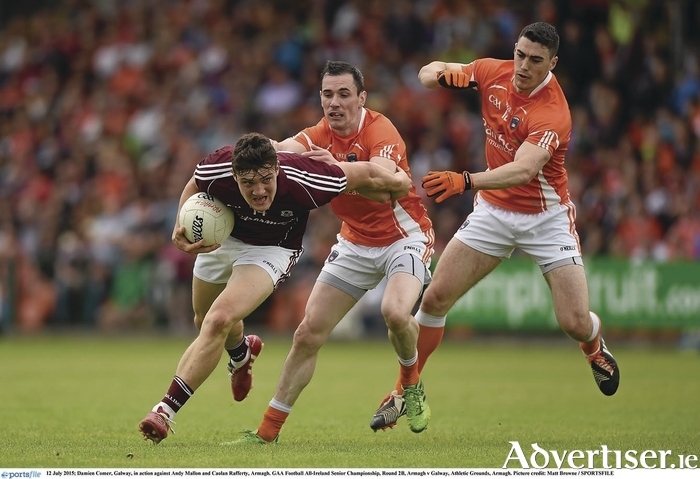 The key moment in the Armagh win was Damien Comer's goal on 47 minutes when the Annaghdown man reacted brilliantly to fist Paul Conroy's free to the back of the net. Cummins and Gary Sice added two more quick points and Galway were in a great position - seven points up - 1-12 to 0-8. A concern for the management team though is that Galway did not score again for the remainder of the game and it is not something that can be repeated this Saturday if they want to progress to the next round, where they would face the losers of either the Connacht or Ulster final for a place in the All-Ireland quarter-finals. Walsh, who was midfield on the Galway sides that defeated Derry in both 1998 and 2001 on the way to All-Ireland success, was philosophical about not scoring for the last 25 minutes. "I'd be worried if we didn't try to make scores, and we did. The Galway players were more than willing to put their tongues out and sprint back, so the spirit is there. It is all about the Derry game now. The Armagh game was the type of game you learn from and we still have some learning to do." Speaking of team spirit, there is an interesting and well worth reading article on Gaa.ie by Arthur Sullivan, about Meath manager Sean Boylan who was the Royals' manager when they won four All-Irelands in the 1980s and the 1990s. The Dunboyne man speaks about team spirit being the most important component in any squad. "They might have all been from different walks of life, different clubs and different ideas - however when they came together it was as Meath men. First and foremost. That is what it takes to win." So while the Galway squad is made up of a vast number of players from clubs representing Cortoon, Corofin, Tuam Stars, Killanin, Micheal Breathnachs, Spideál, and many others, they are all Galway men and the spirit they showed last weekend was impressive. They will need lots of that spirit and Galwegian support to defeat the Derry lads, but, based on last weekend and with the right attitude on show again, they are well capable of doing so.